Directed by James Gunn the fantastic Director of Guardian's Of The Galaxy, and super hero parody film Super, he directed this beauty in 2006. A simple story of a comet crashing down on Earth,filled with Alien Parasites that needs a Host to function. When Grant the local car dealer is infected,with the parasite,he starts turning into this fowl creature. When he impregnate's his lover,she becomes a fat bloated,obese woman,that eventually explodes releasing thousands of parasites,looking very slug lite,that enter into other humans,and turn them into flesh eating drones,all controlled by Grant by a collected consciousness. Only Police Chief Bill played brilliantly by Nathan Fillion of Firefly fame,the best ever series to ever grace our screens,to be cruelly taken away from us after just one season. 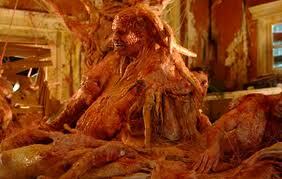 Sorry going off on one then,but this film is very funny,with great one liners,but also very sick,and quite gross in places,with fantastic prosthetics and make up,with a scene near the end much reminding me of the film society,when loads of people merge together into a gross creature controlled by Grant. And who else to play the bad guy Grant, no other than Michael Rooker a really disgustingly funny grossly sick film,that give a great nod to famous other Alien films in the 80's with controversy at the time with people comparing it to the 1986 Night Of The Creeps,and other 80's films such as Slugs. Either way it is an enjoyable Horror Comedy that I can heartedly recommend.